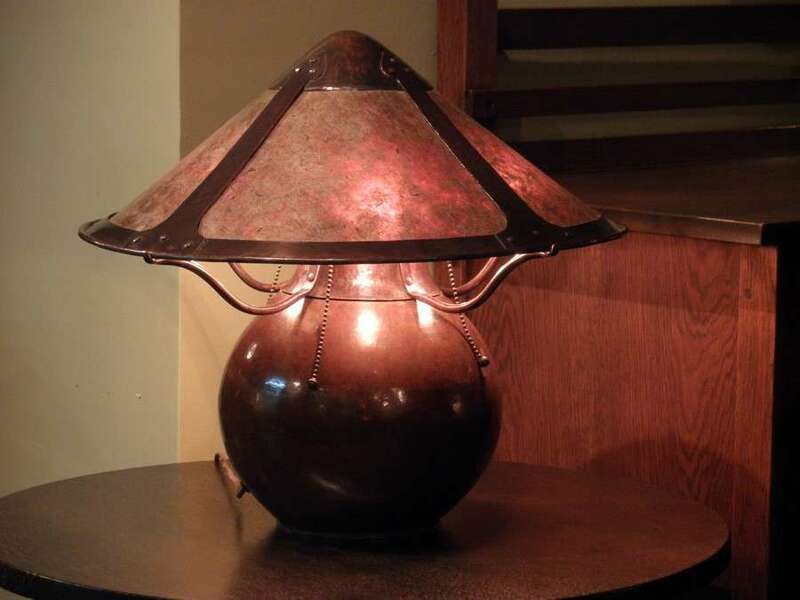 Most Dirk van Erp hammered copper pieces are signed with his impressed windmill signature. 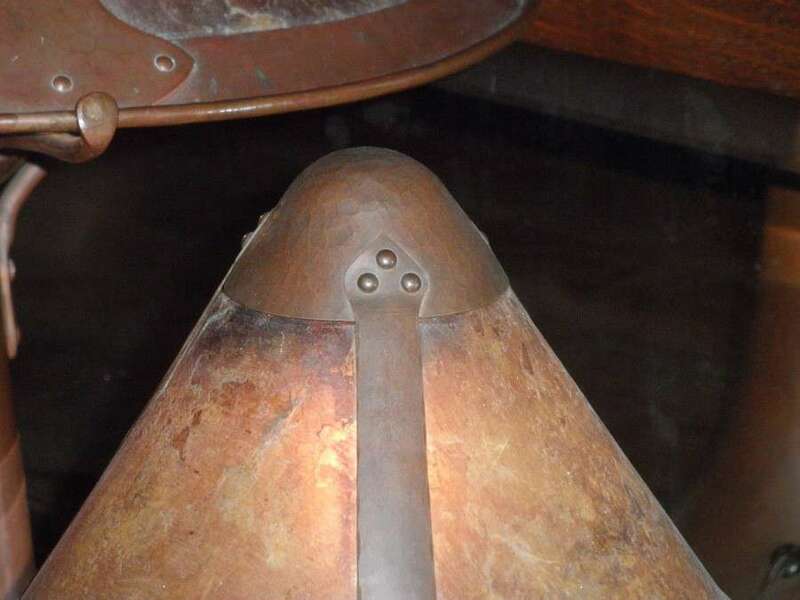 There are several variations of this windmill signature that help us determine the approximate date the piece was made. The first variation of the famous windmill signature is pictured below. 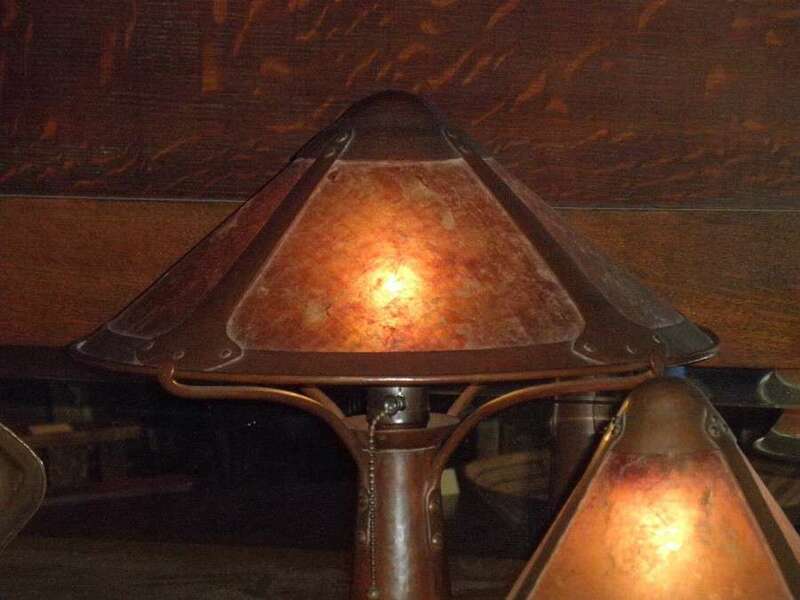 In September of 1909, Dirk van Erp partnered with interior designer D’Arcy Gaw and in February of 1910 they started using the impressed windmill signature that bears both of their names. 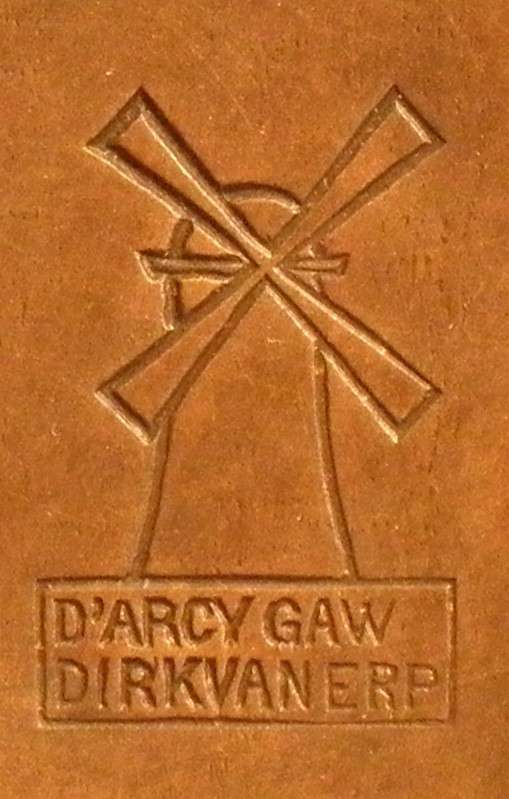 This variation was used from February of 1910 until January 30th, 1911 when their partnership was dissolved and D’Arcy Gaw’s name was removed. 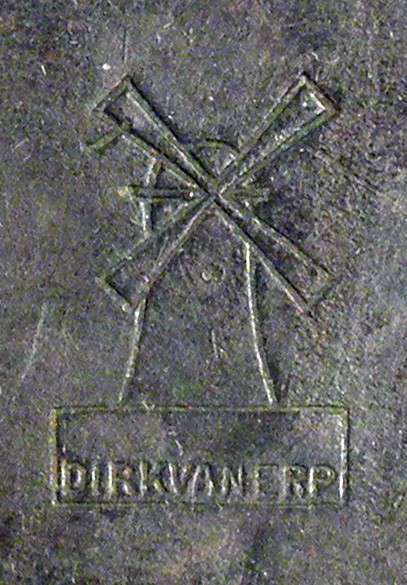 The next variation of the Dirk van Erp impressed windmill signature is known as the “Closed-Box” mark. Dirk van Erp’s name appears at the bottom but D’Arcy Gaw’s name has been removed. Apparently, when D’Arcy Gaw’s name was removed, the right side of the wall surrending her name was weakened. At some point the right side wall of the signature box gave way and then next variation, the “open-box” mark appears. 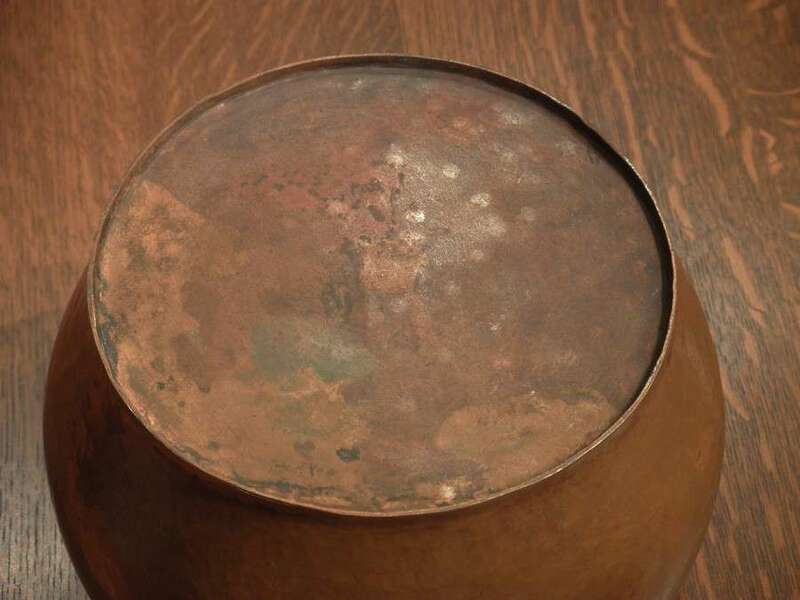 Based on the fact that relatively few pieces of the “closed-box” mark appear, most scholars estimate that the “closed-box” mark lasted maybe one or two years. About 1915, probably for the Panama Pacific International Exposition, Dirk van Erp added the words “San Francisco” as a separate impressed mark. 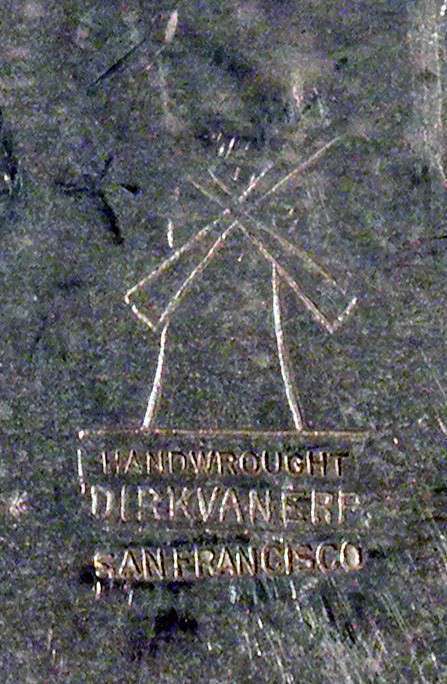 Sometimes we see the “San Francisco” mark placed above “Dirk van Erp” in the location that used to say “D’Arcy Gaw”. Most of the time the “San Francisco” impressed mark is placed below Dirk van Erp’s name. 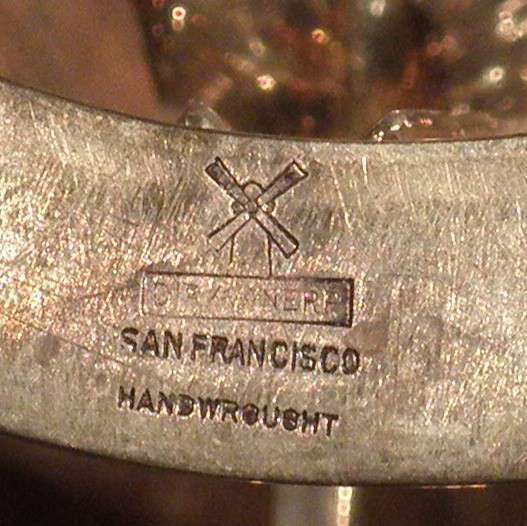 This “open-box San Francisco” mark was used from about 1915 until 1977 when Dirk van Erp’s son, William van Erp died. 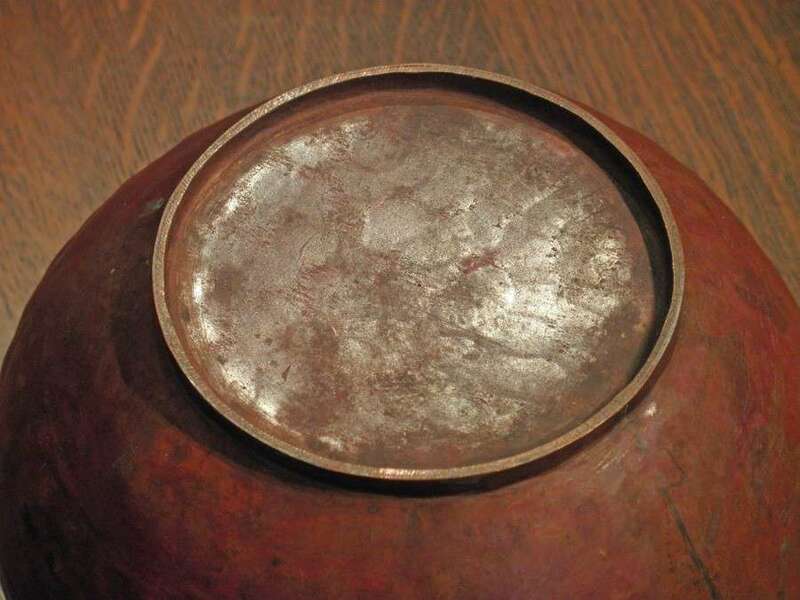 Sometime after 1929, when Dirk van Erp had retired and left his son William van Erp in charge of the studio, William added the words “Handwrought” as a separate impressed mark. 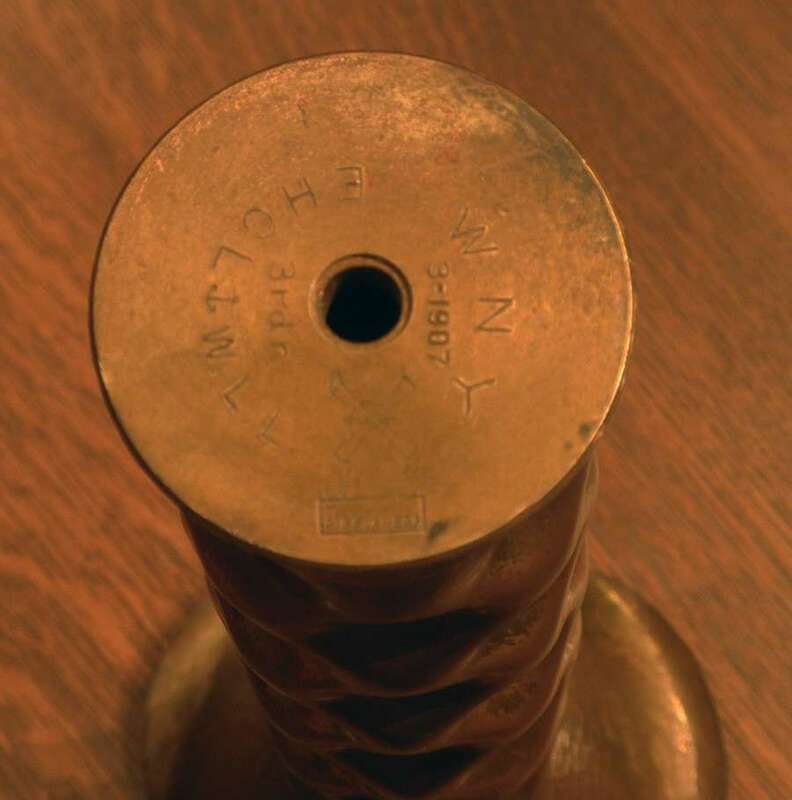 The “open-box, San Francisco, Handwrought” mark was used until 1977. 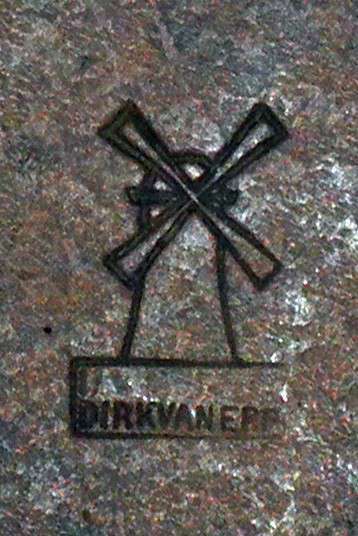 Sometime in the 1950’s Dirk van Erp started signing pieces with a miniature windmill impressed mark. This mark was used until William van Erp died in 1977. 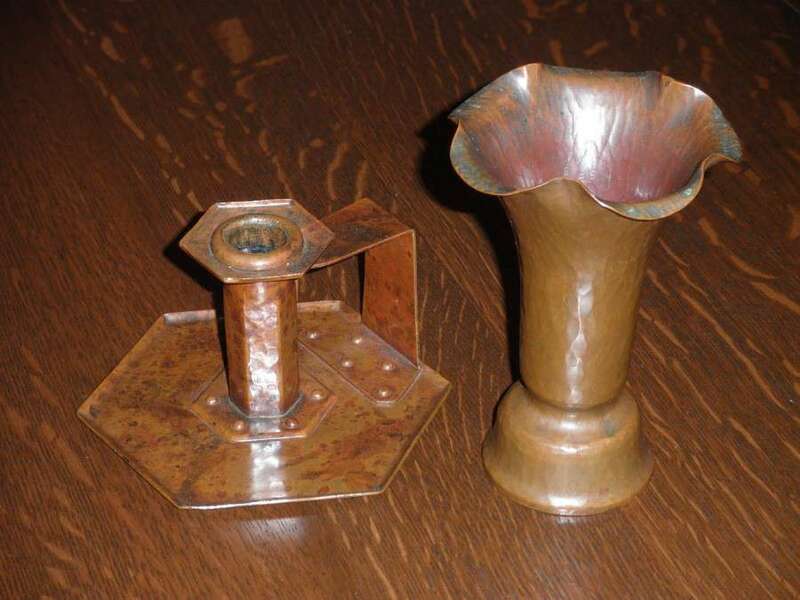 Dirk van Erp silverware pieces are often signed with block letters “DIRKVANERP”. So now we have covered all of the basic windmill signature variations, but what if a piece is unsigned? Could it still be an unsigned Dirk van Erp piece? Dirk van Erp worked in the Mare Island Naval Shipyard from 1900-1908. 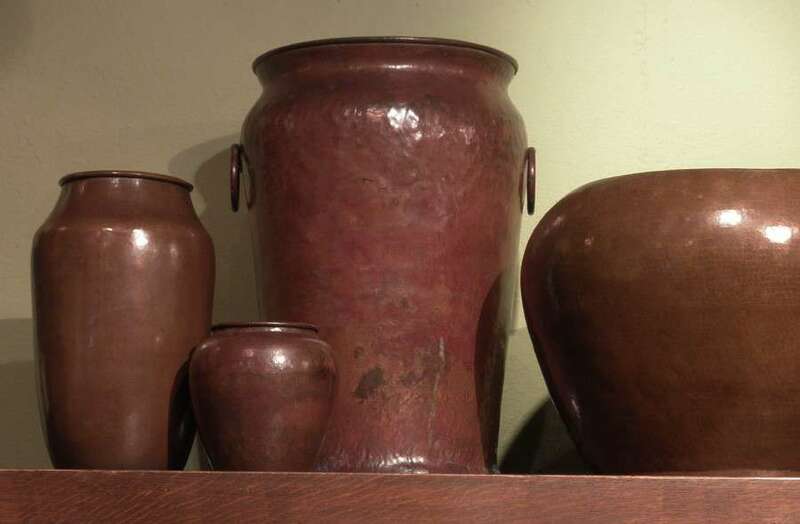 He often brought home brass shell casings and hammered them into lovely vases which he gave to friends. 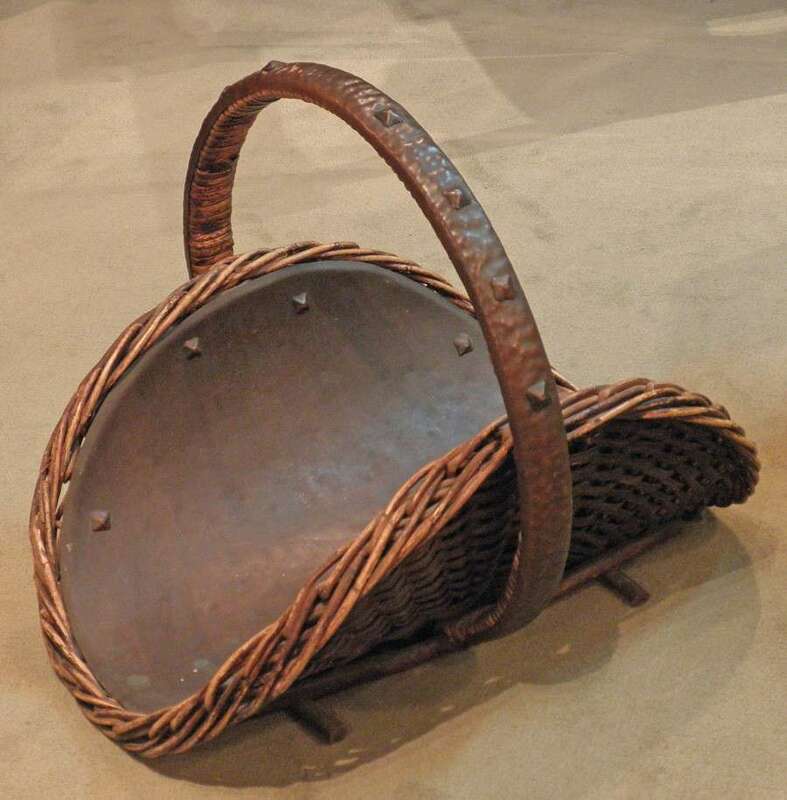 By 1907 he was selling them to art galleries in San Francisco such as Vickory, Atkins and Torrey. 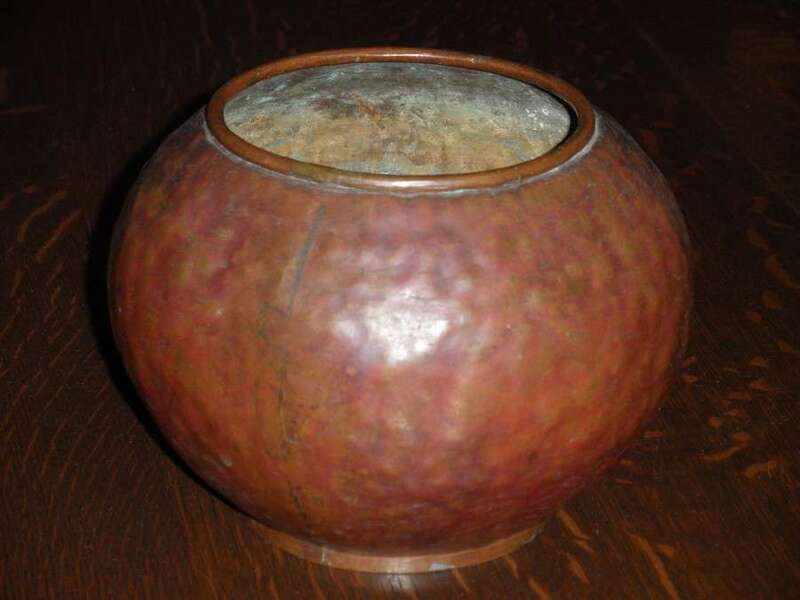 But how do we know if a shell casing vase or trench art piece was made by Dirk van Erp? 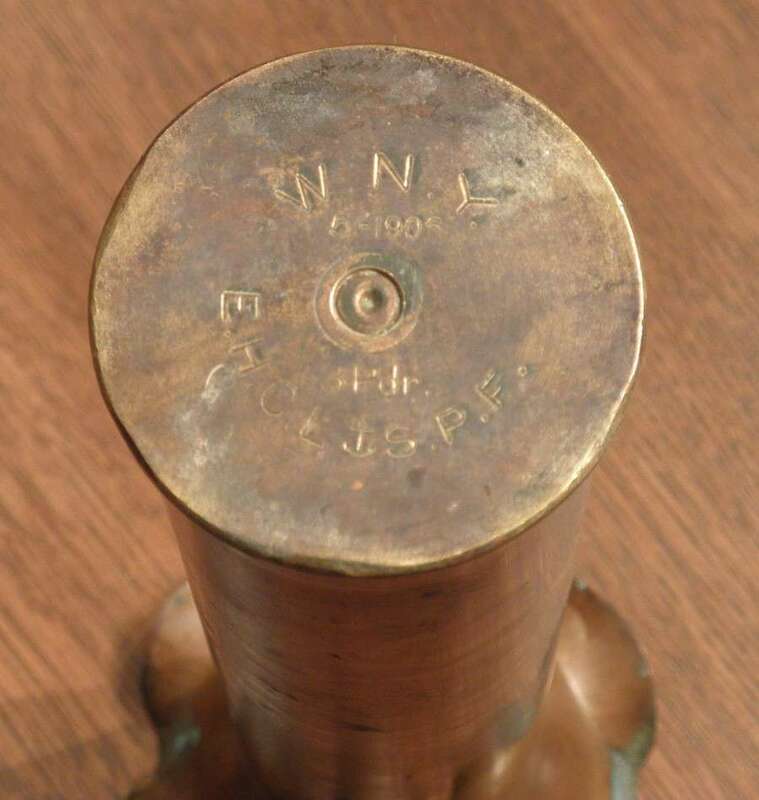 First of all, there were 3 munition manufacturers that were predominanently used by the Mare Island Naval Shipyard: UMC Co of Bridgeport, CT; WNY or Washington Naval Yard; or Winchester Repeating Arms Co. Most Dirk van Erp shell casings will have one of these three stamped on the bottom, but not all. 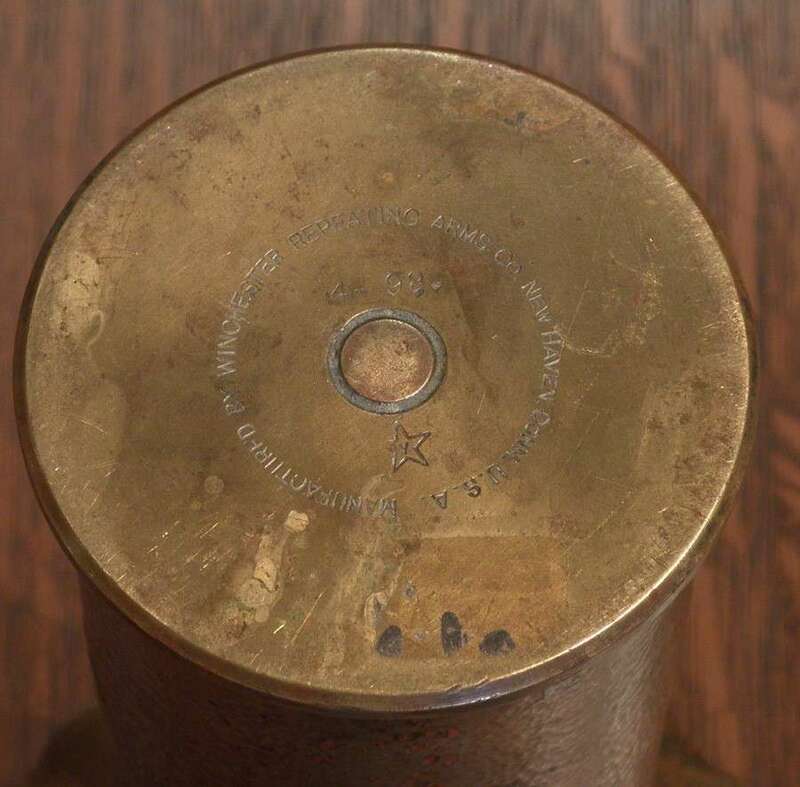 Some of his shell casing have no markings what-so-ever and others are by lesser known munition manufacturers. Also, most of the dates when these munitions were made will be from the 1890s or up until about 1906. They are often dated “8-98” for August 1898. 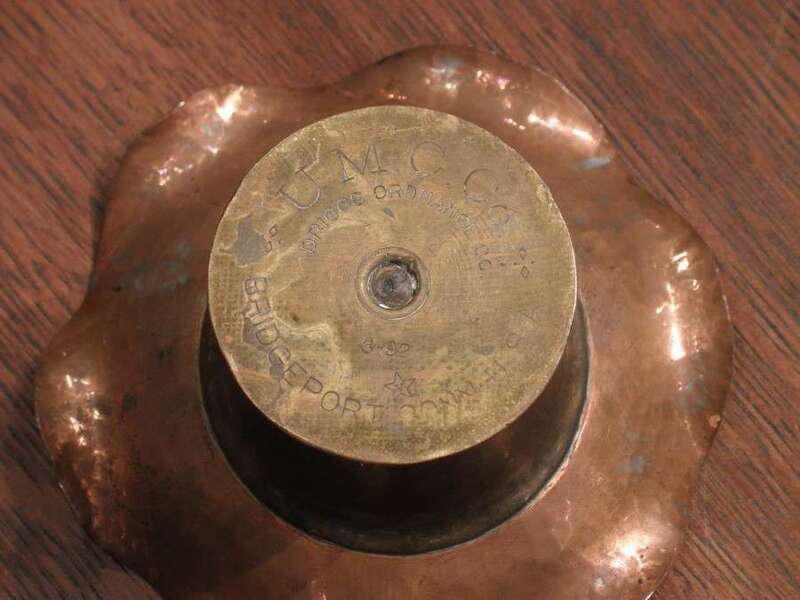 Here are some pictures of the three basic munition manufacturers. During WWI, Dirk van Erp went backed to work at the shipyards, this time for Union Iron Works in San Francisco. 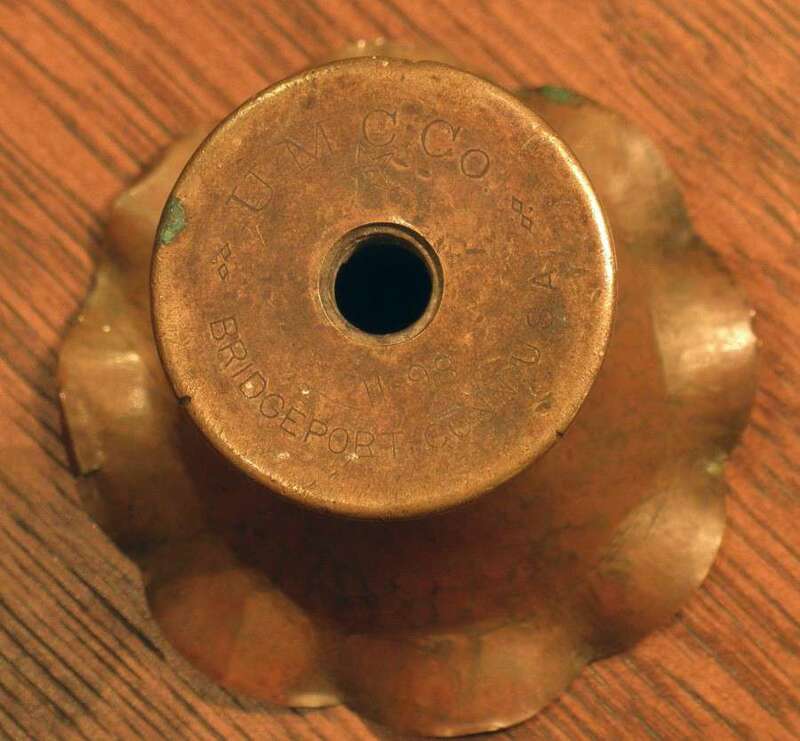 We do occasionally see examples of his shell casings will munition manufacturing dates reflective of WWI. 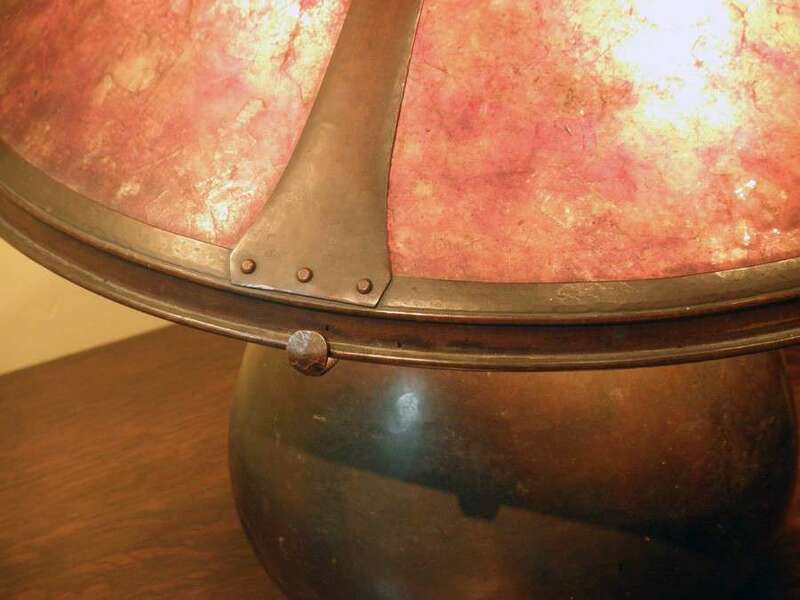 The bottoms of most Dirk van Erp lamps and vases have inset copper bottoms that are often recessed about ¼”. These bottoms often have what I call a “dimpled-dot” formation which we only see within his inset bottoms. 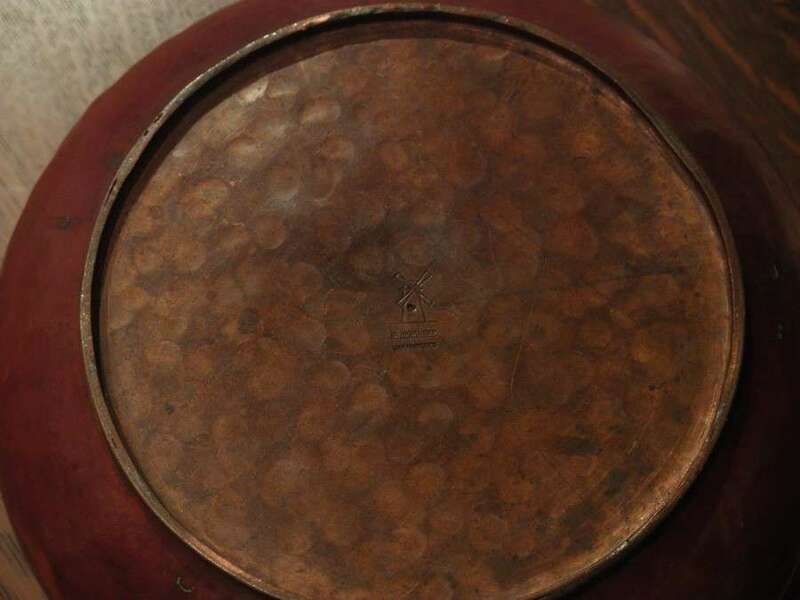 This “dimpled-dot” technique does not show up elsewhere in his metal, just on the bottoms. The rims of his vases and shades are often rolled. The seams are nicely dove-tailed. And the hammering is most often this beautiful, jewel-like rows of hand-hammering. 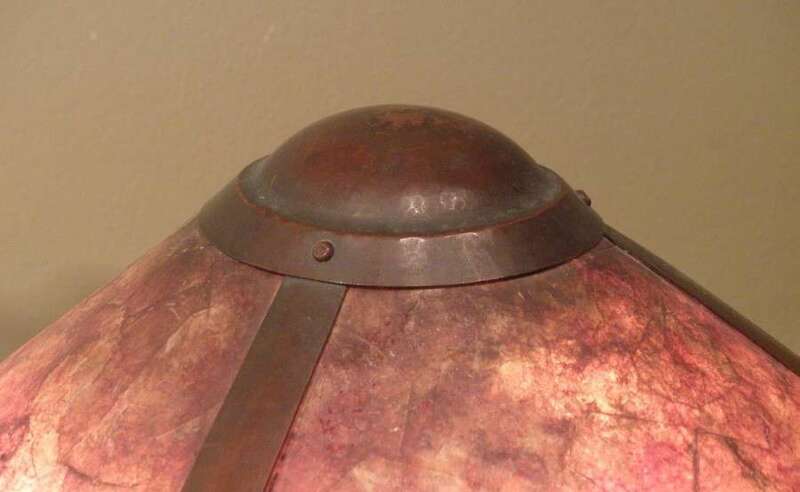 Remember, his shell casings will never have a dove-tailed seam, because they are made from the round brass casings, but most of his copper vases and lamps will. 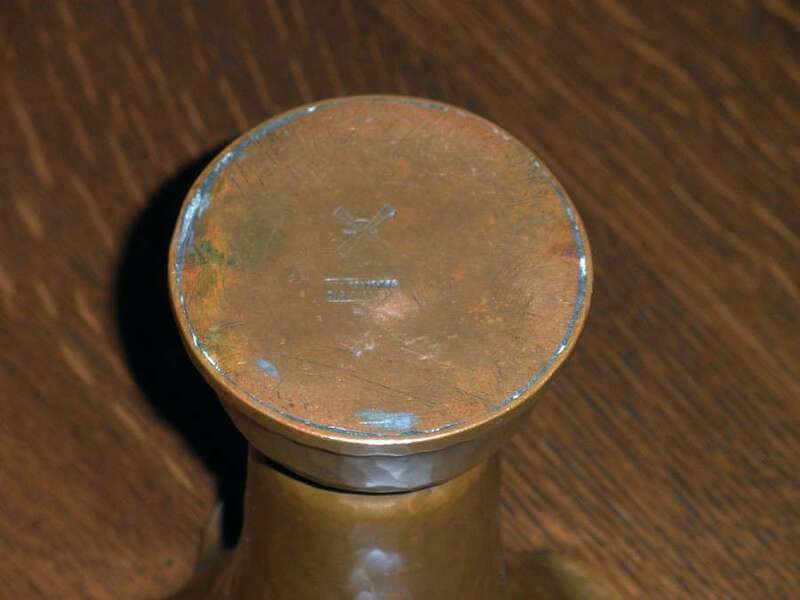 We occasionally see copper vases that do not have any seam. 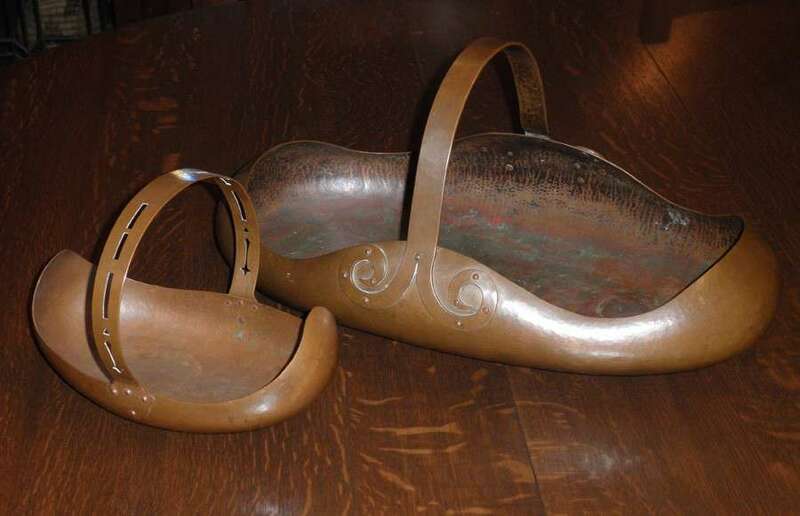 These were probably made from copper pipe or tubing. 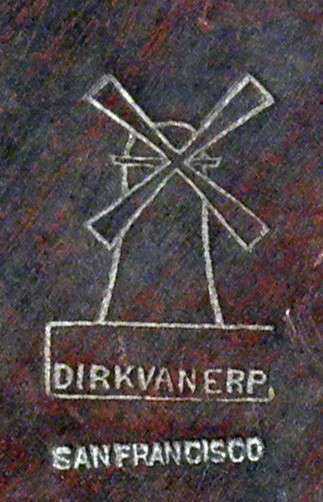 According to the patent filed by William van Erp in 1942, the Dirk van Erp windmill logo had been on continuous use since February 1910. Since we know that Dirk van Erp and D’Arcy Gaw opened their studio in mid September 1909, there were some 5 months of production with no windmill stamp in San Francisco. Prior to this, Dirk van Erp was making pieces in Oakland which were never signed. The pictures that we have from the early San Francisco studio give us ample evidence of the forms he was producing as shown in this November 1909 photograph of the first San Francisco location at 376 Sutter Street. 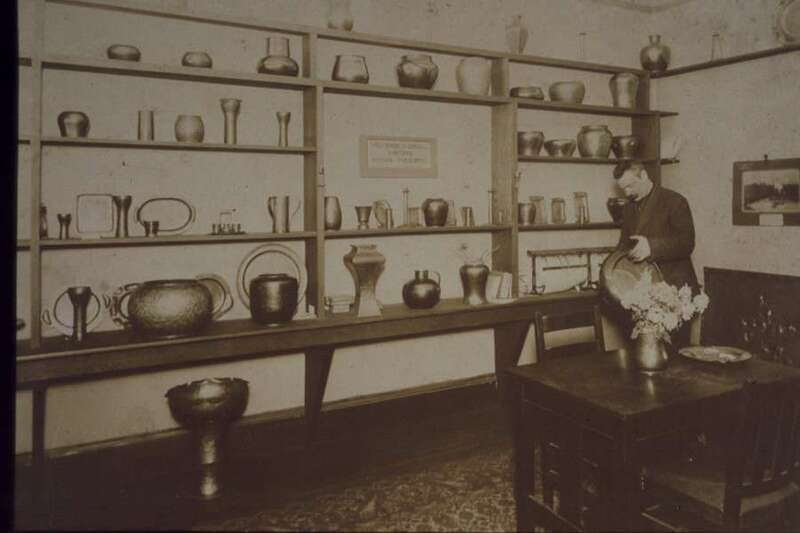 Dirk van Erp holding copper jardiniere in the Dirk van Erp – D’Arcy Gaw Studio, 376 Sutter St, San Francisco, November 1909.